Summary : Surprise, surprise, surprise. That's all I can say. I wasn't expecting much, but instead got a very tasty lemon and honey flavored black tea. Review : I will always buy tea samplers. No matter who makes them, or where I find them, if I see a tea sampler that contains teas I haven't tried, it's a guarantee that the box will find its way into my shopping cart. 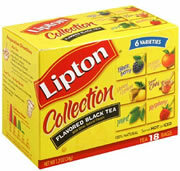 And so it happened one day that I found a Lipton Flavored Black Tea sampler at, of all places, Wal-Mart. So into the cart the tea sampler went. I then promptly forgot about it for 2 months as I concentrated on other teas instead. Yet, one night I found myself in the mood for lemon. And there, sitting in my cupboard, was a honey and lemon flavored black tea, included in the sampler package. So, figuring nothing ventured is nothing gained, I worked up the courage and gave the tea a try. Admittedly, I was less than inspired by the aroma of this tea. The reason for this is because the tea has virtually no aroma whatsoever. And the dinky size of the tea leaves were also far from inspiring. Yet, I'm nothing if not a survivor, so I poured water over the tea and began the 5 minute countdown. Here is how Lipton describes this tea on their website : "Soothe a sore throat or refresh your senses on a hot summer day. No matter how you feel, LIPTON Honey & Lemon Tea will make you feel even better. Enjoy this crisp and refreshing blend of all natural, black tea leaves with the sweet taste of honey. Plus, LIPTON Tea provides a healthy dose of protective flavonoid antioxidants." I have been burned more than once from Lipton tea products, so I took what they said about this tea with a grain of salt. Yet, I need not have been worried, as this tea was simply full of pleasant surprises. The first surpise came as I poured the boiling water over the tea. Almost immediately I was greeted by the plesant fragrance of both honey and lemon. And the second surprise came in the taste department. This tea really does do a nice job of blending black tea with honey and lemon. The strong, overpowering taste of pure black tea is absent. Instead, you have a delightful mix of honey, lemon and a underlying "taste" of black tea in the background. Also happily, the tea lacked any sort of bitterness too...always a relief when sampling a grocery store bagged tea. And the last surprise came in the after-taste department. While the after-taste was hardly overpowering, it was still pleasant...with the taste of lemon and honey lingering on for about 10 minutes after the tea was gone. Recommendation : Yes. If you like lemon teas, you'll definitely like this one. While not as strong as a pure lemon herbal tea, I think most people will still be satisfied with the nice mix of lemon and honey this tea provides.